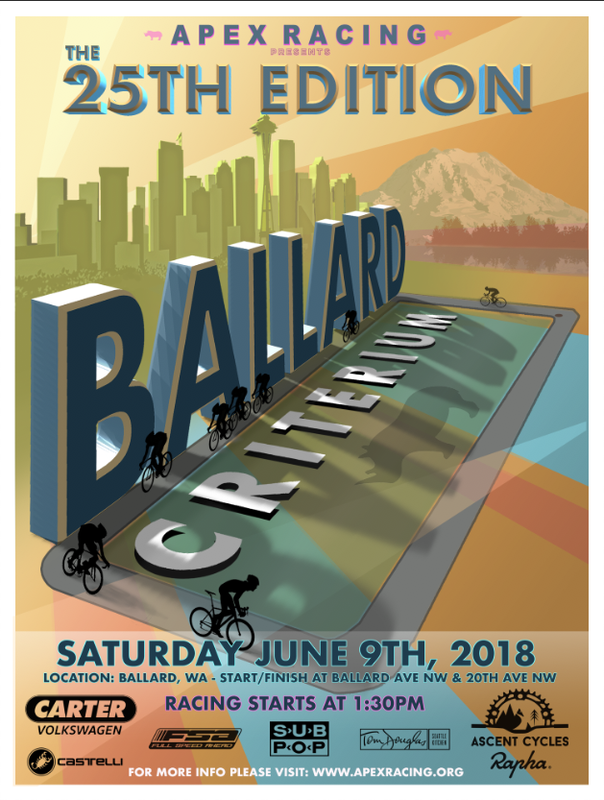 Seattle, WA: Today, Apex Racing, a men’s cycling team of the greater Seattle area, is proud to announce the Ballard Criterium presented by Apex Racing on June 9th, 2018. In its 25th year, this is one of Seattle’s classic bike races with a great city course, lots of fans and a fantastic atmosphere. Just like the original criteriums in Belgium, the keystone pro event kicks off in the evening with fans spilling out of Ballard neighborhood bars and restaurants to watch and cheer. The race course, in downtown Ballard, follows these streets: Ballard Ave NW, NW Vernon Place, Shilshole Ave. NW, and NW Dock Place; the start/finish is near 20th Ave NW and Ballard Ave NW. Racing (several separate categories) will begin approximately at 1:30 p.m. and conclude at approximately 9:30 p.m. Registration, costs, licensing, and notes are online at http://apexracing.org/ballardcrit/. About Apex Racing: (http://apexracing.org/) In 2008, a group of dedicated racers formed Apex Racing to train smart, race hard and race often. Today, Apex Racing has become one of the premier cycling teams in the Pacific Northwest with more than 70 like-minded individuals. The team was built on the tradition of developing new racers, with a strong emphasis on racing as a team and progressing together each year through the race categories. The team’s culture is to help each other improve regardless of the natural talent or category involved, and strictly adheres to the 'no-jerks' philosophy where respect is shown to teammates, riders on other teams, and to the community at large through charitable efforts, time and donations.